We are glad you stopped at the Temple Ministry site. Our desire is to serve God and the body of Christ with what He has given us through years of church service and teaching. Keeping the main thing the main thing, souls for the Kingdom of God is our first priority, then teaching the Word of God, training others to serve God and others in love, and to walk victoriously as Christians. If we can be of any help to you, your church or organization, please let us know. We want to be a blessing. Tim and Jeri are both graduates of Victory Bible Institute in Tulsa, Oklahoma. They have served as missionaries in five countries. Tim founded Temple Ministries, Inc, and was instrumental in starting two churches that continue to thrive. Both Tim and Jeri have served and been involved in every ministry of the church. They started Victory Bible Institute of Fiji Islands, and forty-nine Fijian students graduated that first year before it was handed over to the nationals. They have taught and preached in many churches in several different states. 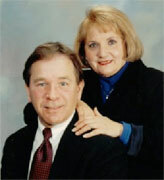 Both are licensed and ordained, and are members of Victory Fellowship of Ministries in Tulsa. Title taken from Hebrews 5:13. To direct Christians by the Word of God from their own righteousness into the righteousness of Jesus Christ. Biblical Teaching: Teach 55 Biblical subjects of balanced Christian living. We teach the whole counsel of Truth. Student outlines with courses for school setting. Preaching: Available to preach the uncompromising Word of God. We teach over 55 Biblical Subjects. Each subject is approximately 16-18 hours of teaching. Will come and preach or teach or talk regarding book and do a book signing. Have courses for church leadership. • TWITTER updates Keeping you up-to-date with what is available and what is going on in the Titusville, FL area.